…fit and nonslip vinyl bottom. 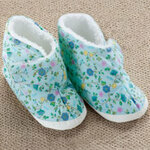 Poly sherpa lined interior features a wide footprint and high toe box with no irritating seams. 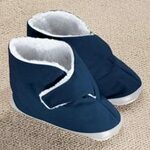 Wide slippers are roomy enough for swollen feet. Machine wash. Imported. 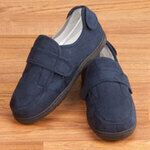 Medium fits shoe size 6 1/2 - 7 1/2. Large fits shoe size 8 - 9. XL fits shoe size 9 1/2 - 11.